INDIANAPOLIS – To honor Fire Prevention Month during the month of October, Citizens Energy Group, the Indiana Region of the American Red Cross, George Washington Community High School and the Indianapolis Fire Department will come together on Saturday, October 14 to serve some of the most vulnerable communities throughout Indianapolis with the Home Fire Campaign. 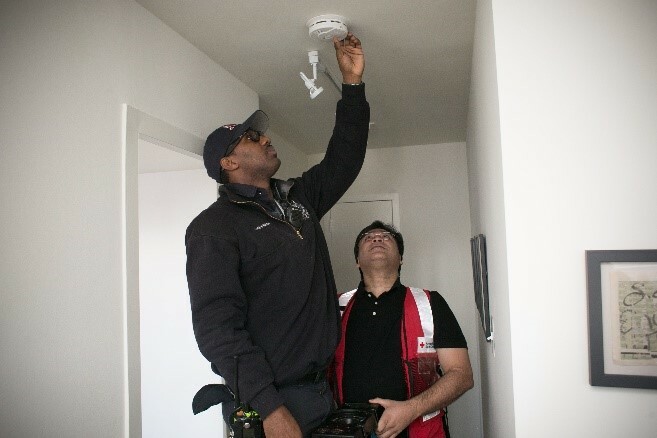 This two-pronged approach to save lives allows for groups to check or install free smoke alarms, and practice emergency fire drills or other disaster-preparedness training at home. The Red Cross’ Home Fire Campaign events seek to ensure that individuals and families in Indiana have an emergency fire plan and have working smoke alarms in their homes. The American Red Cross’ Home Fire Campaign is a nationwide, multi-year effort to reduce the number of home fire deaths and injuries by 25 percent. People of all ages are vulnerable to home fires. Individuals, corporations or community organizations interested in volunteering in their community, can reach out to their local Red Cross chapter, call 1-888-684-1441 or visit redcross.org. The Indiana Region serves 87 Indiana counties consisting of six Red Cross chapters: Central Indiana (Indianapolis headquarters), Northern Indiana (South Bend headquarters), Northeast Indiana (Fort Wayne headquarters), Northwest (Merrillville headquarters), Southern Indiana (Evansville headquarters) and West Central Indiana (Terre Haute headquarters). For more information on the Indiana Region: www.redcross.org/local/in. Follow the Indiana Region on Twitter at: @INRedCross, on Instagram at: @indianaredcross or www.facebook.com/INRedCross. Have a working smoke detector on every floor of the home, ideally near bedrooms. Furnaces should be inspected annually by a licensed technician and air filters should be replaced every 30 days. Keep area around furnace clear of any combustible materials such as brooms, mops, fuel, etc. Do not use an oven or stove as an alternative heating source. Turning on burners and/or opening the oven door in order to heat a home can be dangerous and sometimes deadly.